Growing fruit and vegetables was my labour of love and a hobby which gave me a great sense of fulfillment. Although my efforts in the vegetable garden were never destined to make us self-sufficient, the pleasure of eating something I’d grown from seed or plug was rewarding. Like a sentry I stood guard against the slugs and snails and other predators such as rabbits and birds; each eager to sample the tender green shoots. I watered and fed the young plants with the love of a mother tending a young family. I sheltered them from the harsh salt winds and shaded them from the midday sun until, like young adults, they were strong enough to fend for themselves. White mold and other diseases often threatened the crop and I frantically searched the internet looking for an organic solution rather than using fungicides. Unfortunately, the limited options available and lack of success resulted in many organic pipe-dream failures. My main concern in using chemicals was the devastating effect on the bees and other wildlife. I watched as bees pollinated the flowers of cucumbers, courgettes and tomatoes with the promise of a feast of home grown fruit and vegetables in the weeks to come. Different varieties of lettuce grew in containers as were spring onions, radish, peppers, melons and chives; all basking in the sun just waiting to grace my next salad bowl. The taste of fresh produce served straight from plot to plate within minutes and so different to that of irradiated foods which have been boxed, transported halfway round the world, and then dumped on the supermarket shelves. My vegetable garden was like stepping through Alice’s mirror to my own wonderland where I felt at peace with myself and at one with nature. Readers who have been following my blog for some time may remember my previous post about the root problem caused by the close proximity of the melaleuca hedge. A problem I thought I had resolved by lining the base of the raised bed with a membrane. All was fine for a year, and then I noticed the plants were no longer thriving. When I dug into the soil it was no more than a nest of roots, so you can imagine my language was a little more than sky blue! As the winter turned to spring and the milder weather tempted me once more to revisit my vegetable area I was once again drawn to the family of plants under my care. 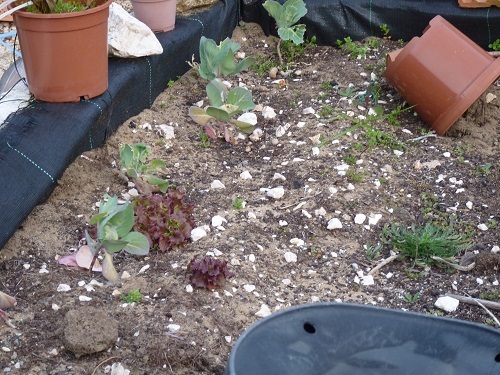 The cabbages and lettuce I had planted last October had barely grown in four months and the onions were even less enthusiastic about their living conditions. The peach tree, which had been the source of such joy last summer when it yielded so many peaches followed by disappointment when I found they were infested with fruit flies, still seemed to be alive. Only time will tell if the lack of water during the winter drought will have an adverse effect. The lemon tree which was bought as a lime tree four years ago, had one lemon and a multitude of tiny white flowers – well that was a result. The leaves yellow but still clinging to life and giving its all. As I continued to examine the plants in the various containers I felt heartened that they had all survived. I surveyed the variety of large empty pots and crates and once again felt excited at the prospect of growing a salad crop. Now was the time for action and a visit to the market was required. – Do I dig out all the soil (again), concrete the base and then add another couple of tiers of bricks and replenish the soil? 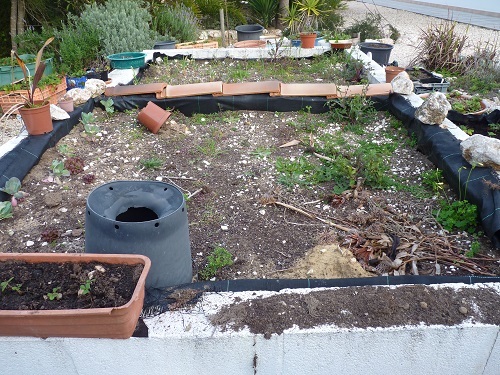 – Cover with black plastic membrane to suppress the weeds and then move all my containers on to the raised bed? The latter would be the easier option but it would restrict the type of fruit and vegetables I would be able to grow? – Knock the whole thing down and forget it existed and persuade Mr. Piglet to get some chickens? The cost of the first option could be prohibitive but on the other hand this is my hobby and it gives me great pleasure. It would involve employing some muscle to undertake the project and muscle costs money! The second option would look and feel and like a bodge job. The third option – well that’s a joke in case he reads this blog post. I went to the market on Monday and bought lots of plant plugs and strawberry plants. As for what happens next – watch this space! It seems there is only one option open to you Carole, the first one, in spite of the cost. This is your hobby, your passion and you can’t put a price on the satisfaction it gives you, so give it your best shot and get some muscle in. You won’t be satisfied with anything less my friend, I know I wouldn’t. You know the old saying “if a job’s worth doing, it’s worth doing right”. Go for it! *Your bed high enough: do not think the roots are making much of a difference unless the sun off the bed for extended times each day! Yes, a couple of extra layers of bricks + GOOD, v rich soil would make a difference. * Soil does not look ‘happy’ – remove the top half, put in a new lot mixed with rich humus and keep it watered! Keep up natural fertilization every fortnight! It sounds like the only reason the membrane didn’t work was due to a lack of depth. I’d try it again on a small scale to find out if doubling or even tripling the depth might help. Once you know how deep you need to go, you can approach it seriously on a full scale. In the meantime you might look at potting plants. It’s not ideal and you’ll lose a little variety, but you’ll still have plenty of fruits and veggies. I wouldn’t give up if I were you. You have learnt so much and you can’t turn your back on those you love. Raise the beds higher a section at a time. You must improve the soil. Fruit and vegetables will only be as good as the soil they grow in. Crops also need to be rotated. Even pots plants need feeding with fertilizer. Any chance you could get rid of the hedge? Build lasagna beds! Roots from vegetable only go down 6 inches or so. Dig put your beds in Autumn, and then chuck everything in, layers of brown stuff, then green stuff, then a bit of soil and so on. 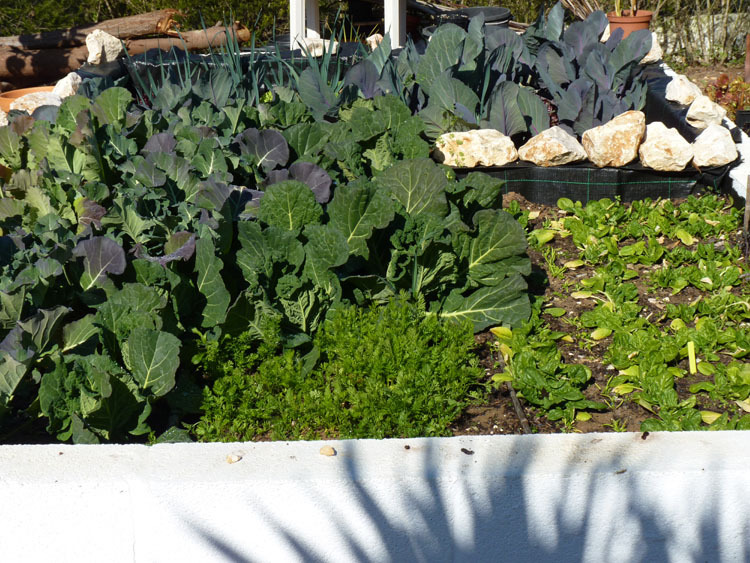 Then water, wait until Spring and plants tomatoes and nitrogen loving plants, then cabbages in Autumn. Newspaper and coffee grounds are good, straw and stable manure form riding schools etc etc…you can make your own soil. Don’t give up! You were my mentor when I started growing in Portugal. PS Spray one part milk to nine parts water fro moulds, it really works and try and get hold of some neem oil. Diluted with milk it works brilliantly for sucking bugs and vegetables can be safely eaten when you use it. I went to a talk by Alys Fowler last week and she recommended the lasagne method that Jane Brewer talks about. I have raised veg beds, starting with a a layer of cardboard, ( wet) and then layers of compost and manure, or anything organic layered with leaves and paper. It works a treat. Your roots won’ t matter if you build up. Nice to find your blog.